In December 2006, a 20-year old pre-nursing major at Sam Houston State University was shot to death in her off campus apartment by a fellow student she had known since high school and briefly dated. She was a victim of stalking. Jake Taylor was infatuated with Rachel Pendray and continually called and texted her. After dating briefly over the summer, Pendray broke off the relationship, and Taylor twice attempted suicide. Local law enforcement wasn’t told about the stalking, so they didn’t take any action. In December, Taylor came over to Pendray’s apartment to talk, but instead shot her and killed himself in her room. 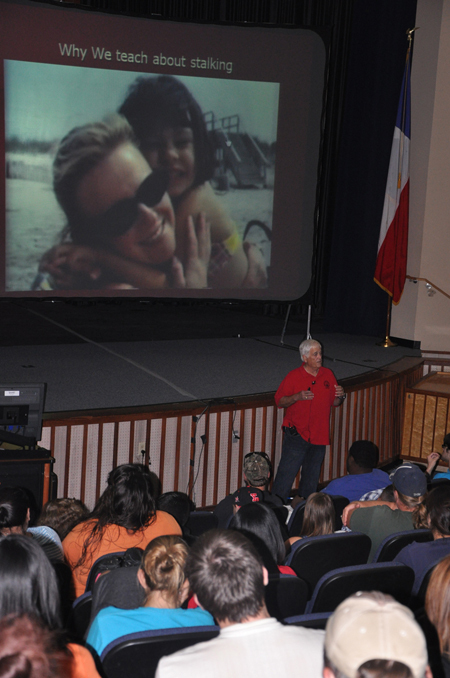 Students and visitors were shocked to learn of the case so close to home during a special presentation on stalking during a recent victimology class at the College of Criminal Justice. Det. Mike Proctor, a retired 34-year veteran of the Westminster Police Department in California and an international expert on stalking, provided tips on how to investigate these crimes and, more importantly, how to help students who are victims themselves. During the presentation, Proctor asked if anyone in the audience experienced stalking firsthand. Fifteen students raised their hands. The U.S. Department of Justice estimates that there are five million cases of stalking across the country annually, and 1-2 percent of victims are killed, which amounts to 3,900 to 7,800 people murdered each year. Stalking is a growing concern around the world, and many countries, such as the United Kingdom, Australia and Japan, are experiencing an increase in this crime. Proctor estimates that one out of every 12 women and one of our every 45 men in the United States are stalked in their lifetime. Proctor serves as a consultant to the Office of Victims of Crime in Washington, D.C., and the National Stalking Academy in the United Kingdom. He also consults with victim advocates, law enforcement and legislators in the U.S. and abroad via the Internet to help develop effective laws on stalking and to educate the public on what to do if they are a victim. His latest book, Antidote for a Stalker, which includes information for victims, victim advocates, law enforcement and educators, is due out in November. According to the Texas Attorney General’s Office, a stalker tries to control his or her victim through behavior or threats intended to intimidate and terrify. A stalker can be an unknown person, an acquaintance or a former intimate partner. A stalker's state of mind can range from obsessive love to obsessive hatred. A stalker may follow a victim off and on for a period of days, weeks, or even years. A stalking victim feels reasonable fear of bodily injury or death to self, a family member, or household member, or possibly damage to property. Stalking can be perpetrated by the stalker or by someone acting on her/his behalf. Stalking also can take the form of verbal threats or threats conveyed by the stalker's conduct, threatening mail, property damage, surveillance of the victim, or by following the victim, the Attorney General’s Office said. Stalking activities may include letters; gifts; notes; telephone calls, texts and messages; vandalism; surveillance; burglaries and break-ins; frivolous lawsuits; or physical assault, said Proctor. “They are experts in domestic terrorism,” said Proctor. The victim may try and bargain with the stalkers and suffer from anxiety, exhaustion, self-blame or anger. Often, the victim just accepts the ongoing advances as a way to make it stop. It is imperative that the victim report the stalking activity to police. Law enforcement needs to thoroughly investigate these crimes, Proctor said, adding that at the family protection unit where he worked, the agency had a procedure to protect victims and win cases in court. Among his advice to law enforcement is for the detective in the case to videotape the victim’s initial interview and to include questions to develop threat assessment of the danger to the victim and their family. In some cases, the stalker may molest children as part of the fantasy over the victim or as revenge for spurning advances. It is also important to take a photo and fingerprints of the victim as well as pictures of the vehicle they drive and residence where they live in case the victim turns up missing, is involved in a hostage situation, or is injured or killed. If a restraining order is to be obtained, it is important for the victim to be able to list and articulate the stalking behavior that had transpired for the court. Police also need to be aware of incidents or restraining orders in other jurisdictions and collect information and contacts. They also should collect any physical evidence, such as cards, letters and phone messages, and log them in. It is also important to be alert, vary your route, park securely, alert managers at work, have a safety check of your home done by police, maintain your privacy, and develop a safety plan. For more information, visit the Attorney General’s website at oag.state.tx.us/victims/stalking.shtml or Proctor’s website at detectivemikeproctor.com.